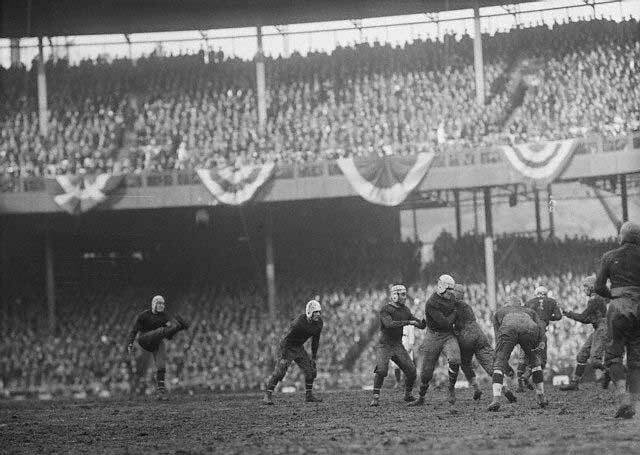 At the legendary Polo Grounds 1925, where the Giants football team (after a couple false starts) finally make their mark on the sport. The New York Giants, currently in the playoffs and on their way to tackle the formidable Green Bay Packers this Sunday, are football’s oldest existing NFL team, and among its greatest — with seven total championship victories since their debut in 1925. But that original team, dazzling with such stars as Jim Thorpe at their original home at the Polo Grounds, was not New York’s first professional football team. It wasn’t even New York’s first football team called the Giants! The first try at a New York Giants football club came in 1919. They were a spin-off of the New York Giants baseball team*, a club considered the best of its day, dominating the sport from the late 19th century and into the 1910s. 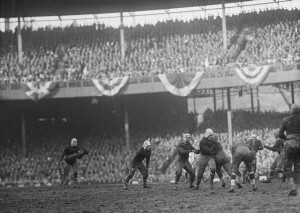 Like the baseball franchise, the young Giants football team was to have played at the Polo Grounds as well, the location for many college football contests of the day. But those college games were played on Saturday, and on the month of October 1919, all Saturdays were fully booked. So the Giants were scheduled to debut on a Sunday, against an Ohio team called the Massillon Tigers. This seemed possible, as team organizers understood that New York’s blue law, prohibiting Sunday play, had been removed from the books. But the city quickly clarified: the law had made way for Sunday baseball, not Sunday football. Since football was more popularly considered a college pastime — many still questioned the validity of so-called ‘professional’ teams — nobody budged for the football Giants. And thus, the game was cancelled, and the team disbanded before they even hit the field. 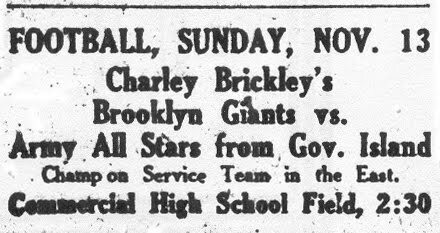 The team’s coach, Harvard football star Charles Brickley, tried again two years later, managing to cobble together twenty-four players, a squad that is sometimes referred to as ‘Brickley’s Giants’ to distinguish them from the 1925 team. And people often choose to distinguish them, because Brickley’s Giants were a utter disaster. As one of 21 teams with the American Professional Football Association during its second season, Brickley’s team lost both its regular-season games. The Buffalo team actually destroyed them, 55-0. The following year, the American Professional Football Association changed its name to the National Football League, but Brickley’s team never made it that far, dropping out for good before the new season. They did continue to play exhibition games, but eventually disbanded by 1923. After these two disastrous attempts, nobody would attempt another Giants franchise for another couple years, when former newsie-turned-bookmaker Tim Mara joined the ascendant NFL with a third go at a New York team. And you know what they say about the third time. By the way, the Maras have kept the Giants in the family since its 1925 debut. Tim’s grandson John Mara is an owner along Steve Tisch (whose last name should be familiar to any students at NYU’s Tisch School of the Arts). *The original Giants baseball team now haunts and torments New York sports fans today in the form of the San Francisco Giants. The franchise moved to the West Coast in 1958.